Try Sweet Pea Cloth Diapers for FREE! 1/6/17 FYSF, Win a Sweet Pea Bamboo OS AIO & Changing Pad! If you love cloth diapering then you'll love this week's giveaway. 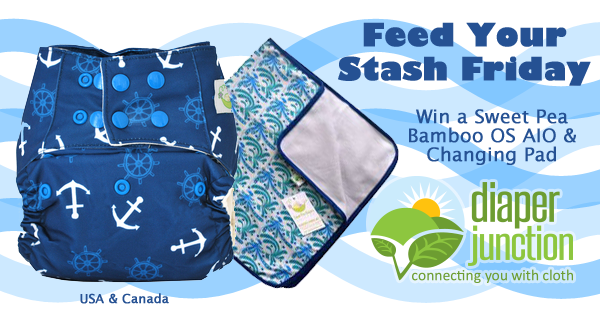 Today's prize is a Bamboo OS AIO Cloth Diaper & Changing Pad from the popular Sweet Pea Cloth Diapers brand. The Sweet Pea One Size Bamboo All In One Diaper offers the squishy soft luxury of bamboo velour at a price that can't be beat compared to similar diapers. 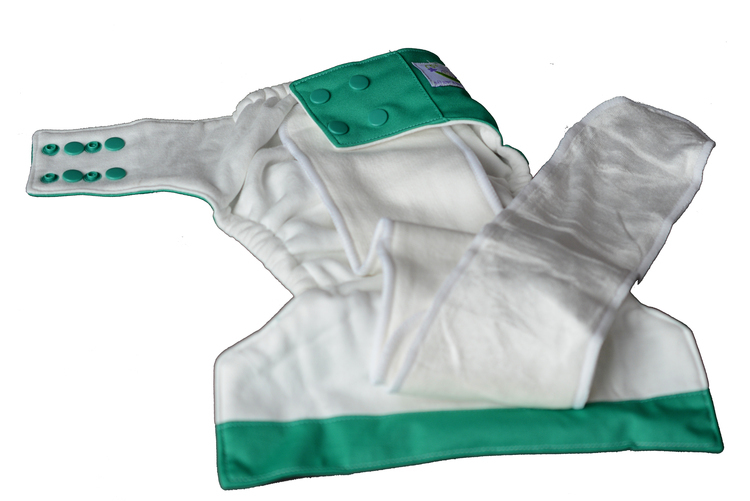 This one size diaper is ultra absorbent and designed to fit most babies from 8 to 35 pounds. The sewn-in tongue style soaker allows for quick drying and no stuffing--just wash and wear! This week one lucky Diaper Junction fan will receive their choice of ANY in stock Sweet Pea Bamboo OS AIO and Changing Pad! This contest is open to the USA & Canada. Winner must be 18 years or older. Winner's entries will be verified and winner will be notified by email. Winner has 7 days to reply and claim their prize. Enter to win using the embedded Rafflecopter form below. I have not tried any sweet pea products yet but would love to! I have never tried Sweet Pea Bamboo diapers, but they sound like a great night time solution for us. I prefer natural fibers, but processed bamboo is an exception because it is so absorbent! I have not tried yet but they kept hopping in and out of my cart during Black Friday! I have only tried sweet pea newborn covers. It would be nice to try other products out. I have 2 Sweet Pea covers and I like them a lot! They fit my 2 year old really well and I like that the tabs are stretchy. Would really love to try a aio now! I have not tried any sweet pea diapers yet, but they have a few cute prints and I would love to try one of their diapers. I have not tried Sweet Pea, but would love to. I've never tried sweet pea yet! I'm actually waiting for my first delivery! So I can start cloth diapering my baby boy! I havent tried any Sweet Pea diapers but would love to. Money is tight so I'm looking at ways to save and I'm trying to convince my husband cloth diapering would be good for us! I haven't tried Sweet Pea diapers, but would love to! I'm in the process of building my stash for a baby due in June, so I haven't tried any Sweet Pea diapers yet. I have a few Sweet Pea OS covers for my toddler and bought a newborn AIO for baby due in March but haven't actually tried a bamboo AIO yet!! I haven't tried these kind yet. Thank you for a chance! I haven't tried any Sweet Pea diapers yet. This would be such a great opportunity to do so! 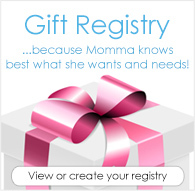 This would make a great gift!! I have not tried sweet pea diapers yet, but have heard wonderful things! I love bamboo and never tried sweet pea before .. thank u diaper junction for this opportunity .. ?? Nope, I haven't tried sweet pea before! I've tried their covers and I love the fit. Thanks for the chance, this print is lovely! Haven't tried this brand before, but I love the nautical print. Thanks for the chance to win! I have not tried any sweet pea diapers yet but would love to. I haven't! Our first babe is due in June so I'm learning all I can about cloth before he or she makes their arrival. :) Excited about trying the different brands! I haven't tried an all in one diaper yet, so would love to give Sweet Pea diapers a try! I've not tried any Sweet Pea products, I'm normally a die-hard Thirsties fan but this print is beyond cute! I've tried sweet pea prefolds and they're really nice. Would love to try the aio! Never tried yet, but would love to! I haven't tried any Sweet Pea yet, but I love the prints. It would love to try this AIO; I love bamboo diapers! I don't think my daughter has any Sweet Pea diapers in her stash - yet! I would love to gift this to her?? i havent tried any of the sweet peas, but love the new stamp print. My baby is due next month and I'm hoping to build a stash! I haven't tried any Sweet Pea products yet, but would love to try this one! I have tried the Sweet Pea cotton prefolds. They were great and affordable. I have a Sweet Pea BAIO and I love it! It fits well and is very absorbent! FTM here, due to in early May 2017! We have a little boy on the way, so many emotions and lots of reading! I've been so curious about the cloth diaper craze and hoping to give it a try. I was extremely preemie when I was born and my parents could only use cloth diapers at the time. I'm sure they've come along way in 30 years! I have not yet tried sweet pea! I have one sweet pea product their changing pad and I love it! It's my favorite changing pad because it's SO soft and the print is gorgeous! Haven't tried Sweet Pea diaps before and I mainly use pockets right now, so this would defnitely be new for me. Might be easier to have a few AIOs with 2 in cloth now though! Love the nautical print on this diap! I haven't tried any Sweet Pea products yet. I haven't tried the Sweet Pea, but I am falling in love with bamboo and I would love to try these as I am currently loving the Diaper Rite 3.1 aio! We have not tried any Sweet Pea products yet, but have heard really good things about this brand! I have two Sweet Pea covers. I like how stretchy the tabs are to help me get a good fit. I won my first sweet pea diaper on a facebook Auction. I wasn't sure I was going to like it, but I ended up loving it! It has pocket openings on both ends, comes with 2 microfiber inserts and is very, very soft. Additionally it fits my HUGE 32lb, 34" 20 month old son great, it is a big diaper on its largest rise setting. Additionally it fits my 10lb 3 month old when it's on the smallest rise setting. I love this diaper and will definitely be buying more!!! Would love to win a sweet pea diaper. Never tried them before, they may become my next addiction. We haven't yet, but we would love to! The prints and design look like they will be great. I haven't tried sweet pea diapers yet, but a friend said she loved them. I love the designs they come in. I have one sweet pea bamboo AIO and I would love more! I have not tried any sweet pea products yet, but I would love to! I would love to try these babies out!!! I haven't tried any sweetpea diapers yet but I really want to! Would love to win this ! I haven't tried a new diaper in a long time! I have not tried these but I'd like to! I haven't tried any Sweet Pea products but would love that winter weight nursing scarf. Or this AIO bamboo diaper for its absorbency! I have a Sweet Pea Cover, Otter Love. It's so cute! I have never tried a sweet pea product but would love to!!!! Thank you for the oppertunity to be in the giveaway! We only have one Sweet Pea AIO but we love it and would love to have more! It fits well, and I love the soft velour on the soaker! I have not tried their diapers or changing pad yet but I love their wetbags. I have tried the covers and they worked great.